When I read the description of these amazing bars, I had to make them. The Brown Eyed Baker describes them as Blondies on Crack… too funny…too yummy, can anything be too yummy??? Not in my book. 1. Preheat oven to 350 degrees F. Butter or spray a 9×13-inch baking pan, then line it with parchment paper, leaving a bit of an overhang over all the edges. 2. In a medium bowl, whisk together the flour, baking powder and salt; set aside. 3. In a large bowl, whisk together the melted butter and light brown sugar until combined. Add the eggs and vanilla and whisk until well combined. Add the dry ingredients to the bowl and, using a rubber spatula, gently fold them into the egg mixture until just combined. Do not overmix. 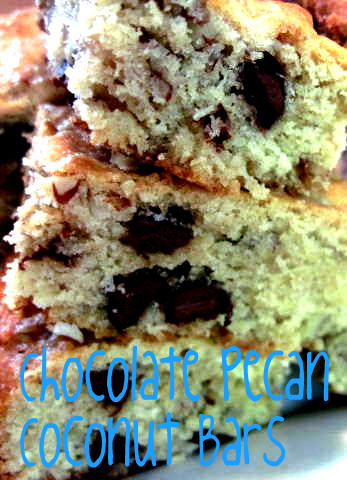 Fold in the toasted coconut, pecans, semisweet and white chocolate chips. Dump the batter into the prepared pan, and smooth it into an even layer. 4. Baking until the top is shiny and cracked and feels firm to the touch, 22 to 25 minutes. Cool completely in the pan on a wire rack. Remove the bars from the pan using the parchment handles and transfer to a cutting board. Cut into 36 bars and serve. The bars can be stored in an airtight container at room temperature for about 5 days. Note: You don’t have to toast the coconut or pecans if you don’t want to, it just enhances the flavor.